Numark Mixtrack Platinum – Faders Music Inc.
As you play your hits, Numark provides an awesome feature that takes you into a new dimension with the Mixtrack Platinum: The custom 1.75” displays offer a colorful hi-resolution display enabling you to monitor information on bpm, platter position, time remaining, pitch adjustment, and keylock. (Ok—you can thank us later.) 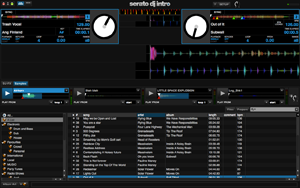 You can also switch between four decks and control which deck is active while creating a platinum mix. Gain Control—With 4 channels you have complete volume gain control to enable you to deliver a perfect mix. We added this feature because of the demand from DJs like yourself who wanted to have more control of their mixes.